Read this manual carefully before performing required maintenance. This manual will be referred to for Inspection/ Maintenance and Repair procedures. Before starting an inspection, be sure to clear the rifle. Do not actuate the trigger until the rifle has been cleared. Inspect the chamber to ensure that it is empty and no ammunition is in position to be chambered. Do not keep live ammunition near work area. All Active Army M161/M16A1 rifles must be inspected and gaged at least once annually for safety. All Army Reserve and Army National Guard M16/M16A1 rifles must be inspected and gaged at least once every two years, after the initial inspection/gaging procedures have been accomplished. This two year interval may be maintained unless preventive maintenance checks and services (PMCS), or other physical evidence indicates that an individual unit's M16/ M16A1 rifles require inspection at a more frequent interval. If it is determined that a yearly inspection is necessary for an individual unit, only that unit will be affected. This will not affect other units in regard to the interval of inspection. Air Force users refer to inspection requirements in AFR 50-36, Volume 1. 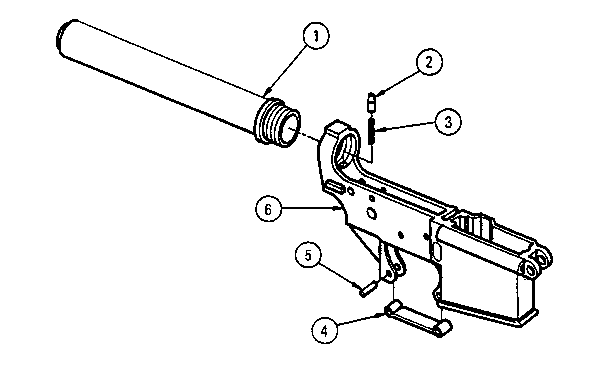 Below Direct Support Maintenance, DO NOT interchange bolt assemblies from one weapon to another. Doing so may result in injury to, or death of, personnel. Bolt cam pin must be installed or weapon will blow up while firing the first round. If the bolt cam pin is not installed, injury to, or death of, personnel may result. Dry cleaning solvent is flammable and toxic and should be used in a well-ventilated area. The use of rubber gloves is necessary to protect the skin when washing rifle parts. When using P-C-111, avoid skin contact. If it comes in contact with the skin, wash off thoroughly with running water. Using a good lanolin base cream after exposure to compound is helpful. Gloves and protective equipment are recommended. For further information on safety, care, and handling of ammunition: Army and Air Force users refer to M16/M16A1 Operator's Manual TM 9-1005-249-10/TO 11A13-10-7; Coast Guard users refer to OP4 or OP5.